How can N queens be placed on an NxN chessboard so that no two of them attack each other? Below, you can see one possible solution to the N-queens problem for N = 4. No two queens are on the same row, column, or diagonal. Note that this isn't an optimization problem: we want to find all possible solutions, rather than one optimal solution, which makes it a natural candidate for constraint programming. The following sections describe the CP approach to the N-queens problem, and present Python programs that solve it using both the CP-SAT solver and the original CP solver. A CP solver works by systematically trying all possible assignments of values to the variables in a problem, to find the feasible solutions. 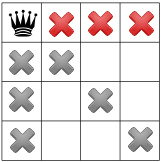 In the 4-queens problem, the solver starts at the leftmost column and successively places one queen in each column, at a location that is not attacked by any previously placed queens. Propagation — Each time the solver assigns a value to a variable, the constraints add restrictions on the possible values of the unassigned variables. These restrictions propagate to future variable assignments. For example, in the 4-queens problem, each time the solver places a queen, it can't place any other queens on the row and diagonals the current queen is on. Propagation can speed up the search significantly by reducing the set of variable values the solver must explore. Backtracking occurs when either the solver can't assign a value to the next variable, due to the constraints, or it finds a solution. In either case, the solver backtracks to a previous stage and changes the value of the variable at that stage to a value that hasn't already been tried. 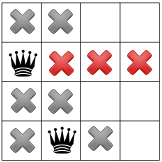 In the 4-queens example, this means moving a queen to a new square on the current column. Next, you'll see how constraint programming uses propagation and backtracking to solve the 4-queens problem. 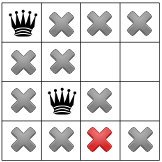 The solver starts by arbitrarily placing a queen in the upper left corner. That's a hypothesis of sorts; perhaps it will turn out that no solution exists with a queen in the upper left corner. Given this hypothesis, what constraints can we propagate? 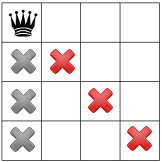 One constraint is that there can be only one queen in a column (the gray Xs below), and another constraint prohibits two queens on the same diagonal (the red Xs below). And so the solver must backtrack again, this time all the way back to the placement of the first queen. We have now shown that no solution to the queens problem will occupy a corner square. We have our first solution! If we instructed our solver to stop after finding the first solution, it would end here. Otherwise, it would backtrack again and place the first queen in the third row of the first column. The N-queens problem is ideally suited to constraint programming. In this section we'll walk through a short Python program that uses the CP-SAT solver to find all solutions to the problem. The solver's NewIntVar method creates the variables for the problem as an array named queens. For any solution, queens[i] = j means there is a queen in column i and row j. Here's the code that creates the constraints for the problem. # The following sets the constraint that all queens are in different rows. 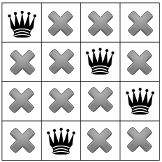 # Note: all queens must be in different columns because the indices of queens are all different. # The following sets the constraint that no two queens can be on the same diagonal. # Note: is not used in the inner loop. # Create variable array for queens(j) + j. # Create variable array for queens(j) - j. Let's see how these constraints guarantee the three conditions for the N-queens problem (queens on different rows, columns, and diagonals). Applying the solver's AllDifferent method to queens forces the values of queens[i] to be different for each i, which means that all queens must be in different rows. This constraint is implicit in the definition of queens. Since no two elements of queens can have the same index, no two queens can be in the same column. 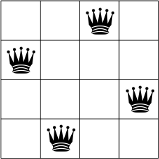 If the diagonal is descending (going from left to right), the row number plus column number for each of the two queens are equal. So queens(i) + i has the same value for two different indices i. If the diagonal is ascending, the row number minus the column number for each of the two queens are equal. In this case, queens(i) - i has the same value for two different indices i. So the diagonal constraint is that the values of queens(i) + i must all be different, and likewise the values of queens(i) - i must all be different, for different i. Then we can apply AddAllDifferent to the array diag1, as shown above. The variable array for queens(i) - i is created similarly. To print all solutions to the N-queens problem, you need to pass a callback, called a solution printer, to the CP-SAT solver. The callback prints each new solution as the solver finds it. The following code creates a solution printer. Note that the solution printer must be written as a Python class, due to the Python interface to the underlying C++ solver. The solutions are printed by the following lines in the solution printer. 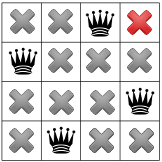 x0 = queens(0) x1 = queens(1) ... x7 = queens(7) where xi is the column number of the queen in row i. The next section shows an example of a solution. The following code runs the solver and displays the solutions. The program finds 92 different solutions for an 8x8 board. Here's the first one. The xi correspond to row numbers. So, for example, x0 = 3 means that the row number for the queen in the first column is 3. The following code creates an alternative solution printer, which prints the solutions as chessboard diagrams. # Print row with queen. # There is a queen in column j, row i.
solves the problem for a 6x6 board. Here is the entire program for the N-queens program. # The array index is the column, and the value is the row. # By default, solve the 8x8 problem. The following code declares the original CP solver. The solver's IntVar method creates the variables for the problem as an array named queens. 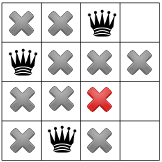 For any solution, queens[j] = i means there is a queen in column j and row i. # All rows must be different. # All columns must be different because the indices of queens are all different. # No two queens can be on the same diagonal. These constraints guarantee the three conditions for the N-queens problem (queens on different rows, columns, and diagonals). The code above adds this constraint by applying the AllDifferent method to queens[i] + i and queens[i] - i, for each i. The next step is to create a decision builder, which sets the search strategy for the problem. The search strategy can have a major impact on the search time, due to propagation of constraints, which reduces the number of variable values the solver has to explore. You have already seen an example of this in the 4-queens example. The following code creates a decision builder using the solver's Phase method. See Decision builder for details on the input arguments to the Phase method. Let's take a look at how decision builder directs the search in the 4-queens example. 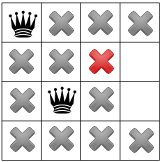 The solver begins with queens, the first variable in the array, as directed by CHOOSE_FIRST_UNBOUND. The solver then assigns queens the smallest value that hasn't already been tried, which is 0 at this stage, as directed by ASSIGN_MIN_VALUE. This places the first queen in the upper left corner of the board. You can check that the rest of the search follows the same rules. The following code runs the solver and displays the solution. # Iterates through the solutions, displaying each. # Displays the solution just computed. Here's the first solution found by the program for an 8x8 board. Many solutions are just rotations of others, and a technique called symmetry breaking can be used to reduce the amount of computation needed. We don't use that here; our solution above isn't intended to be fast, just simple. Of course, we could make it much faster if we wanted to only find one solution instead of all of them: no more than a few milliseconds for board sizes up to 50. The complete program is shown belos. OR-tools solution to the N-queens problem.